As I discuss in this video – I found the PDF template found on Thomas Sanladerer’s site a little bit tricky. It might be that its just lost quality due to scanning or something but the exact cut lines are hard to figure out as there is a double line around the edge and the hole marks are also slightly vague. On top of that I found it quite awkward to line up when printing on multiple sheets of A4. So I made my own! Hopefully it helps out someone in the future looking to cut their own Prusa i3 frame. 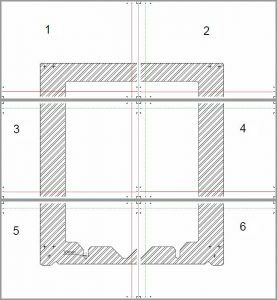 As you can see, it is designed to be printed onto 6 A4 sheets – then each sheet should be cut along the green dotted lines. The edges these leave should be butted up against the red lines (not to be cut!!). Tape it all together and there you have it. You will notice that this is slightly different to Tom’s – not in dimensions but in corner treatment. I have changed all internal corners into 5mm radius arcs. The idea being that you drill all these points with a 10mm drill before cutting out. This is much easier to do that trying to make accurate tight angles like the original. One thing to note; I have only included the centre marks for the Z Axis top and bottom mounts. The rest are either for tie wrapping wires to or mounting the power supply/control boards. As none of that is critical, I left them out. The other thing I might suggest is to only drill the two Z axis mount holes at the very bottom, then drill the rest using the actual 3D printed parts as a template. The reason being is that, with all the best will in the world, it is unlikely you will drill them all accurately from the template. As Tom found out. My method was to drill the two bottom holes, use those to bolt in place the bottom Z axis mounts, then attach the smooth rods and top mounts and align everything up with a square. Mark the position of the rest of the holes through the 3D printed parts and then drill them.